Professor Peter Gould speaking in front of his course, 'Inner Peace and Outer Peace.' Spring 2018. Peace studies is an interdisciplinary area of inquiry that draws on social science, the humanities, the creative arts, and science in an effort to understand reasons for war and ways to resolve conflicts without violence. Our students examine the many meanings of "security," study the nature of power and political participation, consider contrasts between war culture and peace culture, recognize differences between positive peace and negative peace, investigate the relationship between inner peace and outer peace, see the role the arts can play in analyzing war and promoting peace, and explore ways of addressing conflicts that honor the integrity of all parties involved. 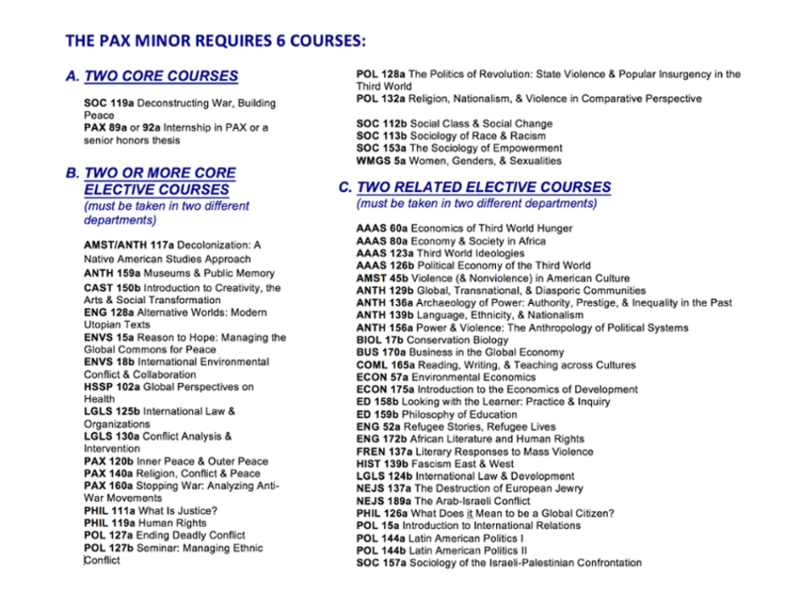 The requirements for this minor include SOC 119 (Deconstructing War and Building Peace), two core elective courses, two related elective courses, and either an internship or a senior thesis.